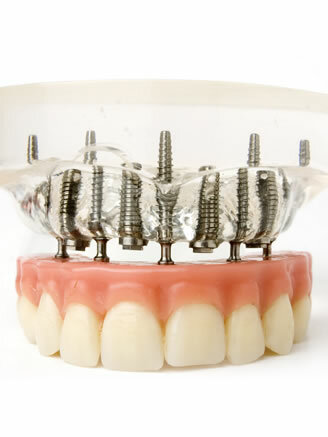 Implant-supported dentures are over-dentures fixed to the gums by implants. For patients who have an uncomfortable or loose-fitting denture, stabilizing it with implants can be a more comfortable and functional solution. Implants are placed in the jaw, where they are anchored firmly in the surrounding bone. Attachments are placed in the underside of the denture and connect to the implants. When placed in the mouth, the denture snaps onto the implants, to keep it stable and secure. Implant-supported dentures look more natural than conventional dentures because less plastic is needed for retention. Wearing implant-supported dentures can also help your appearance in the long term, by preventing jaw shrinkage and bone loss. Patients with conventional dentures have difficulty speaking clearly. Slurred speech and clicking noises are common problems. Implant-supported dentures can help you relax and converse easily, with a more clear and natural voice. Best of all, with implant-supported dentures, there is no need for denture adhesives.